Few argue that William Morris was one of the most influential tapestry designers in history. His brilliant woven works were nothing short of magnificent. From the portrayal of brave knights, legendary quests to imaginative fantasy, Morris and his factories took tapestries to an entirely new level in terms of weave, the use of color, composition and subject matter. Vines and Acanthuses tapestry is based on perhaps his signature work. 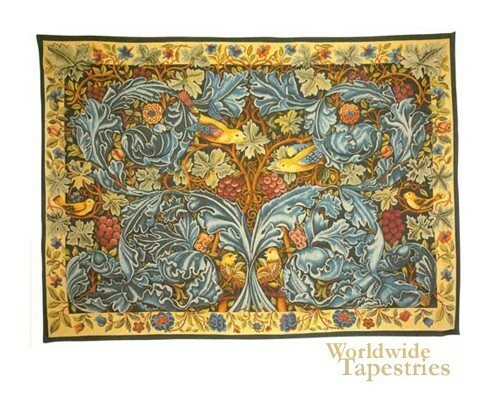 Woven in 1879, it is the only large tapestry woven by William Morris himself. The original Vines and Acanthuses hangs in Kelmscott Manor, Morris’ summer home on the River Thames which he shared with Pre-Raphaelite painter Dante Gabriel Rossetti. This wonderful work by the master himself is perfectly reproduced. Vines and Acanthuses tapestry is lined on the back and has a tunnel for easy hanging and display. Note: Tapestry rod, where pictured, is not included in the price. Dimensions: W 78" x H 56"